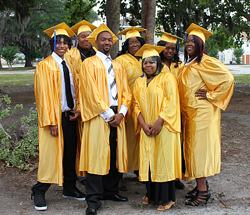 YouthBuild Lakeland was founded in 2007 in an effort to help young adults, 18 to 24 years of age, who have dropped out of high school and want to work towards improving their lives. While in the six-month program, participants receive classroom instruction in preparation for the GED exam. In addition, participants work on a Habitat for Humanity work site where they receive hands-on training in construction by building affordable housing for low-income families. There is also a strong emphasis placed on career development, personal development, and leadership development. During the program cycle, participants have an opportunity to earn many different types of certifications. A few of the certifications that we offer include nationally recognized certification in carpentry, CPR and first aid, forklift operation, typing, financial literacy, and Certified Nursing Assistant (CNA) certification. Participants also earn money every two weeks for their full participation in the program.